Infections are the cause of a great deal of ill health in early years settings. Lethargic and grumpy children are not such a pleasure to work with, and what infects children often infects adults, spreading not only the germs but also more grumpiness! Common colds are so taken for granted that the impact upon young children can be under-estimated. Decreased levels of activity, increased irritability and less sociable behaviour are cited as examples of how children can be affected by a cold virus. Frequent colds and other illnesses that are regarded as minor can impact negatively on a child’s developmental outcomes. In addition to the impact upon children, infections can be a cause of stress as a consequence of staff absences which puts pressure on other colleagues who are having to cover their work. Parents too can be put under pressure when their children are unwell and unable to attend their setting. Therefore, the case for preventing infection is compelling. Infections are caused by micro-organisms (meaning that they are living cells that can only be seen with a microscope); viruses are responsible for conditions such as the common cold and chickenpox. Bacteria, for example salmonella, staphylococcus and streptococcus cause many illnesses such as diarrhoea and vomiting and meningitis. Fungi is responsible for thrush infections, which is most common in children in their nappy area or skin folds. Infections are most frequently spread by inhaling (breathing in), ingesting (eating or swallowing) or inoculation (through the skin when the protective barrier has been penetrated). In the middle of the 19th century, the mortality rate for children under the age of 5 was high: many succumbed to life-threatening health problems. Babies were especially vulnerable and as many as 50% died before their first birthday. The main cause of these deaths was a range of illnesses caused by infections. During Victorian times, living conditions started to improve, clean water and sewerage meant that there was less contamination by infection-carrying micro-organisms. Also, scientists developed greater knowledge about the causes and prevention of infection. During the last century, the invention of immunisations and antibiotics were important milestones that have saved many children from death or disability caused by infections. The practitioners who participated in my research had experience of a number of infections that commonly affected their children. Besides the common cold, other infections such as chickenpox, conjunctivitis, norovirus (causing diarrhoea and vomiting) and hand, foot and mouth were frequent causes of illness. Nobody wants to see a child unwell because of an illness, and it is worth considering that some children are more vulnerable to the impact of infection than others. Children with chronic (on-going) health conditions such as asthma or diabetes are likely to experience a prolonged period of illness as a consequence of an infectious disease. The most common trigger of asthma is the rotavirus, which causes a ‘cold’ or respiratory symptoms. So, alongside the symptoms associated with such an infection, which include high temperature and lethargy, there is an increased risk of a child with asthma having an asthma attack. An asthma attack is a terrifying experience for children and asthma remains a significant cause of death in this country. Other children who are regarded as vulnerable to the impact of infection are those with complex medical needs. Infections that may have minimal impact on children without ongoing health issues may make children with complex medical needs severely unwell and, in some cases, respiratory infections can prove potentially fatal. Again, this highlights the importance of protecting children from infectious diseases as much as possible. Preventing infection in early years settings can be regarded as a safeguarding responsibility, this is because promoting children’s health is part of the responsibility of all professionals who work with children. The single most significant way of preventing infection is to reduce the spread of micro-organisms caused by touching, so close attention must be paid to handwashing procedures. Such is the evidence to support this claim that the World Health Organisation have a handwashing day to highlight its importance in promoting health by reducing the spread of infection. Whilst it may appear obvious that handwashing is something we should all do, there is a risk that we can become complacent about how and when we wash our hands. This is especially important when we are responsible for modelling good handwashing habits for children to copy. Good handwashing habits take time to develop, supervision of children takes time too. Practitioners highlighted to me that staff in pre-school settings are often vigilant about supervising handwashing, but when children transition to Reception, and the ratios of children to staff increase, supervision can be trickier. As always, teaching children using playful approaches is an effective strategy to adopt and there are several videos of handwashing songs on YouTube that may be helpful to use with the children in your setting. Immunisations play a vital role in preventing infection. However, this is another area where we can become complacent. We may know the names of the infectious diseases that immunisation programmes prevent, but it is less likely that we understand or remember the ways that diseases affected children in bygone days. Infections such as polio and diphtheria frequently left children with a legacy of disability and often resulted in death. Working with parents to develop a consistent and shared approach to preventing infection is vital, but not without its challenges. Developing and implementing a robust sickness policy can mean that children need to be away from the setting with subsequent difficulties for parents who do not have flexibility in their work patterns. Some parents have certain health beliefs, for instance, there may be limited understanding about the nature and treatment of infections. A global threat to how infections are managed is the misuse and overuse of antibiotics, therefore, an understanding of safe and effective use of antibiotics is an important consideration as part of your medication policy. The presence of an infection can provoke strong reactions from parents who may not understand the background to a child being diagnosed with an infection. One example is when a child with complex medical needs developed MRSA and, because of media reporting, parents were aware of the infection but needed reassurance that their child was not susceptible to the infection in the same way. The practitioners who were managing the situation found the HPC website invaluable in giving them evidence-based guidance that they could use to reassure the parents that their children were safe. Parents often have strong feelings about having their child immunised as laid out in the government’s childhood immunisation policy. Whilst it is important to support parents’ wishes where possible, it is also part of a setting’s responsibility to safeguard all children’s health by ensuring the vast majority of children are immunised. There are very few children for whom medical exemption from immunisations is advised. One example of exemption is for children who are receiving drugs which suppress their immunity as part of cancer treatment or for those who have received an organ transplant. In the UK, it is not mandatory to have children immunised before starting school, but in some countries, such as the United States, it is a legal requirement that parents provide evidence of their child’s ‘shots’ before they start school. Preventing infection plays a key role in keeping children safe and maximising their participation in their early education, as well as improving their wellbeing. It may not be possible to eradicate all infection, but there may be more that can be done to reduce the incidences of illness caused by infection. Careful scrutiny of the causes of children being unwell and a review of policies, including those that are aimed at keeping the environment as hygienic as possible, is time well spent, especially if it reduces the stress levels for everybody in your setting! Jackie Musgrave joined the Open University as Programme Lead for Early Childhood in October 2017. Before that, she worked in the Centre for Children and Families at the University of Worcester from April 2012 as the Course Leader for the BA (Hons) in Early Childhood (Professional Practice). Jackie trained as a General Nurse and she did post-registration training to become a Sick Children’s Nurse at Birmingham Children’s Hospital. Her professional interests as a Practice Nurse included chronic disease prevention programmes, childhood immunisations and women’s health promotion. Jackie graduated with a Master’s degree in Early Childhood Education from the University of Sheffield, gaining a distinction for her dissertation as well as being awarded the Rutland Prize for Early Childhood Education. Her doctoral research explored the effects chronic health conditions on young children and ways in which practitioners could create inclusive environments for these children. 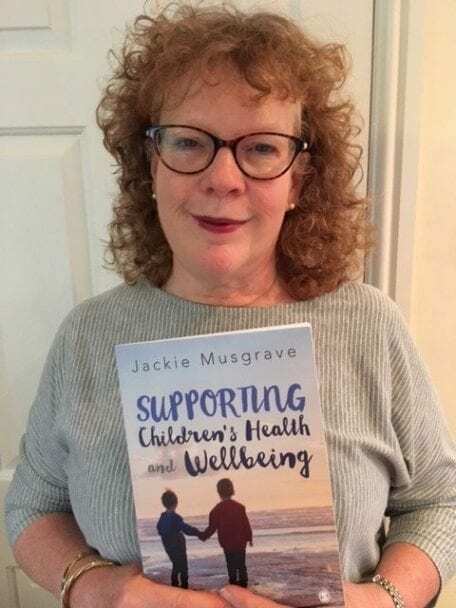 Jackie’s research-based book, Supporting Children’s Health and Wellbeing was published by Sage in May 2017.